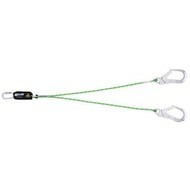 Miller kernmantel edge forked shock absorbing lanyard 1 meter with twist lock karabiner and 2 GO65 scaffold hooks. Products tagged with Miller kernmantel edge forked shock absorbing lanyard 1 meter with twist lock karabiner and 2 GO65 scaffold hooks. Honeywell / Miller Miller kernmantel edge forked shock absorbing lanyard 1 meter with twist lock karabiner and 2 GO65 scaffold hooks.